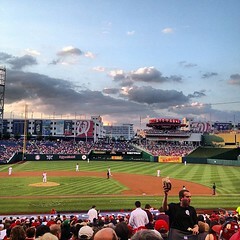 It was a picture perfect evening to sit in the stands and root on the home team last night at Nationals Park. Perfect, that is, if you enjoy chewing your nails down to the quick. Ross Detwiler threw six innings of incredible baseball last night, showing once again the Nationals made the right decision in keeping him and demoting John Lannan. Detwiler was ruthlessly efficient, striking out six and walking just one, dropping his April ERA to 0.56, the lowest on the staff right now, and second in the league. K Street continues to be the reason for the Nationals place atop the NL East, without question. The Nationals’ hurlers lead the majors in strikeouts (138), and opposing average (.204), 2nd in WHIP (Walks + Hits divided by Innings Pitched), 2nd in ERA, and are 4th in earned runs allowed. The bullpen has been just as dominant as the starting pitchers, Thursday night’s rough outing notwithstanding. There are many reasons to be hopeful as a Nats fan right now, but there are a few reasons to be measured in your enthusiasm, as well. The bats are going to be a problem. Nady and Ankiel are far from ideal choices for the Nats, I’m afraid. Though I love Ankiel’s arm in center, neither he nor Nady have the kind of run production to make them “good” out there. Most years, Nady is in the negative when it comes to WAR (wins above replacement), which means any of the Nationals’ solid outfield prospects could do what he’s been doing out there. Look for Nady to be the first cut when Harper comes up after the Super 2 deadline. Morse will be out til the All-Star Break, and maybe a bit after, and that hurts things. LaRoche has been a pleasant surprise so far, but we still see too many nights like last night where he’s swinging big, but far too often. His pair of strikeouts last night were the images photographers dream of, but fans dread: lavish, extravagant, but short of the mark. Really, power IS the problem with the Nationals. Desmond and Espinosa are capable of 15-20 jacks per season – and that’s really all we can expect from them in this lineup – and Zimmerman’s worth maybe 25. LaRoche, if he remains healthy, can be counted on for about that many. That leaves Jayson Werth. His biggest year was 36 homers, but that was the 2009 Phillies, where they literally had to pitch to him. There was no escaping anyone in that lineup, so he produced big time. That could happen again – but maybe not until next year when they’ve got more of a murderers row. So, I would expect that the Nats “top five” can be counted on for about 115 home runs this year. The 2011 Cardinals, who won it all, had 115 from their top 5 bats. The 2010 San Francisco Giants had 102. But, by contrast, the 2009 Phillies had 167. In 2008, they had 152. So – you can win it without a ton of offense. It’s just no guarantee.